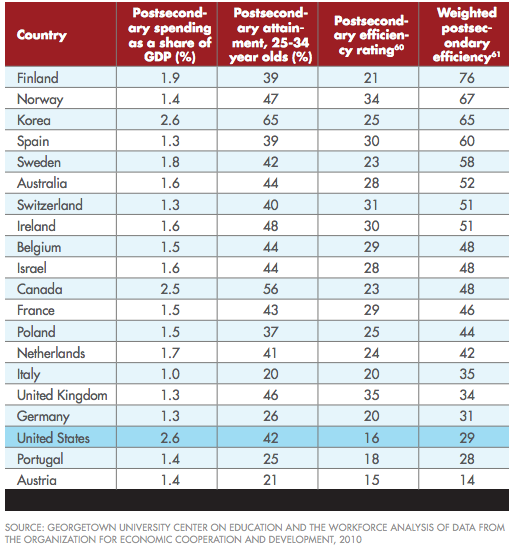 We spend more of our economy on higher education than almost any other developed country, and achieve some of the worst results. Much of the waste is related to colleges with low completion rates, which essentially function as “dropout factories”. … Unlike, say, Germany with its renowned apprenticeship systems, there aren’t really great alternatives to college if you want a middle-class life in the United States. So ill-prepared young adults flood into degree programs they never finish, leaving the U.S. with some of the lowest completion rates in the developed world. It is undeniably expensive to provide low-income students with the opportunity for higher education, but these numbers call into question how well the U.S. is doing in this endeavor.